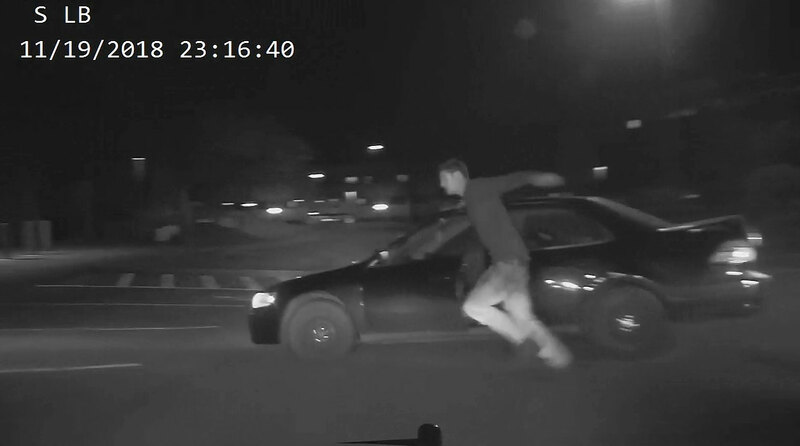 Posted: Wednesday, Nov. 21, 2018, 7 a.m.
A suspected car prowler bailed out of a vehicle following a Nov. 19 high-speed pursuit -- only to have his leg pinned under the wheel of the still-rolling car he'd just abandoned. The suspect is currently in the hospital with a broken leg, and will soon be booked on a variety of charges. The case began just after 11 p.m. on Monday, Nov. 19, 2018. Deputies contracted to the Happy Valley Police Department responded to a call of a theft in-progress in the 11000 block of SE Cedar Way in Happy Valley. The caller told dispatchers that she had seen a male subject attempting to open the door to her mother's vehicle before walking to a neighbor's house and steal items out of another vehicle. The suspect was last seen driving southbound on SE Cedar Way in what was described as a dark sedan. Deputies arrived and began searching the neighborhood for the suspect. At 11:12 p.m., a deputy spotted a black '98 Honda Accord with Washington plates parked in the 11300 block of SE Cedar Way. A large pile of belongings were visible in the back seat and scattered throughout the car. This was a likely suspect vehicle. The suspect -- Isaiah John Gellatly, 31, of Vancouver, WA -- was lying in the fully reclined driver's seat. Suddenly, as the deputy shone his spotlight into the car, Gellatly sat upright. He put the car in gear and peeled away from the scene. The deputy activated lights and sirens. Gellatly did not stop. A pursuit was underway. The pursuit continued westbound on SE Cedar Way to SE Bethany Drive, then northbound towards SE William Otty Road. The chase eventually made its way to Sunnyside Road, where his tires were successfully punctured using spike strips strung across the road at Sunnyside and Valley View Terrace. Gellatly continued to flee at high speeds, despite the puncture. He repeatedly blew through stop signs and crossed over into the opposing lane of traffic during the high-speed pursuit. Gellatly finally turned into a business complex around SE 101st and Sunnyside. He was now having difficultly controlling his vehicle, hitting curbs and retaining walls (and, at one point, the bumper of a pursuing patrol car). Gellatly opened his driver's side door. He bailed out of the Honda and started running -- without putting his vehicle into park. Gellatly ran in a westward direction toward a building. He was running alongside his own rolling car. Gellatly then attempted to cut in front of his vehicle -- around the same time it crashed into a tree and building wall. Gellatly fell to the ground and was quickly subdued by deputies. The lower third of Gellatly's leg was pinned under the wheel of the Honda. The tire was completely deflated from hitting the spike strips. Deputies used a car jack to lift the car off Gellatly's leg prior to medical and fire arrival. His pant leg was cut away with trauma shears to check for injuries. He was transported by AMR to OHSU with a broken leg. Deputies found numerous items inside the vehicle believed to be stolen property, including a tennis racket, a Ping-Pong paddle, a Texas Instruments calculator, designer sunglasses and a Schwinn scooter. At this writing deputies have contacted two victims and reunited them with stolen items taken from their vehicles. When Mr. Gellatly is released from the hospital, he will be transported to Clackamas County Jail and booked on charges likely to include Attempt to Elude, Reckless Driving, Unlawful Entry into a Motor Vehicle, and Theft II. Mr. Gellatly is well-known to authorities. In September 2016 the Portland Police Bureau arrested him on charges of stealing a car from the Mousetrap Tavern in North Portland with the owner's 8-year-old black labrador inside (Story: https://www.koin.com/news/man-accused-of-stealing-car-with-dog-inside/870149909). 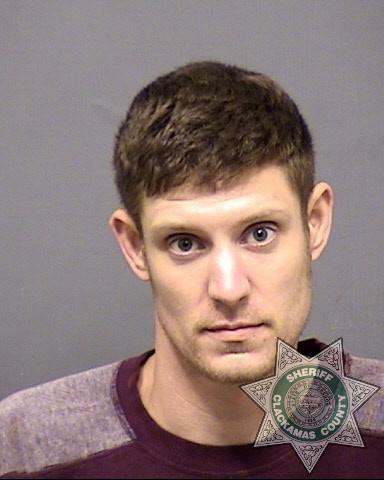 A Multnomah County booking photo of Isaiah Gellatly from this 2016 arrest is attached. Anyone with additional information on Isaiah Gellatly is urged to contact the Sheriff’s Office Tip Line -- by phone at 503-723-4949 or by using the online email form at https://web3.clackamas.us/contact/tip.jsp. Please reference CCSO Case # 18-031272. Three Clackamas County cities -- Happy Valley, Estacada and Wilsonville-- contract with the Clackamas County Sheriff's Office to provide municipal police services.